When it comes to managing my time at work, I would say that I have been pretty productive and efficient at getting things done! If only I was as productive when it came to my blog and lifestyle LOL Oops! I’m hoping that I will be able to find a balance with it all very soon, but when it comes to work, I value the time I have to get work done. My first year of teaching I remember always taking work home, because I didn’t want to feel overwhelmed the next day. I remember planning lessons, completing lesson plans, or creating my PowerPoints for the next day late at night. However, I can honestly say I learned so much from my mistakes my first year. With that said, I’m sharing my top four tips that I think can help you manage your time at work in order to work more efficiently. After all, who likes taking work home? When it comes to my office, I have to have everything in its place and labeled. This even includes making folders on your computer so that you can have everything in file and order. I have to be neat, so when it comes to getting things done quickly, I am usually able to jump straight into the work since I already have everything in order. I even think that controlled chaos can work, if you know where everything already is. I can recall several times as a teacher when I walked into classrooms asking for certain paperwork and some teachers were literally going through every stack to find it. Don’t worry I’ve been guilty of that, but I learned after my first year of teaching I needed to change that. I know being in the classroom, papers can easily get lost, so I would always have labeled bins or designated areas where I had a stack of homework or in class assignments where I could keep things in controlled chaos. So, whether you’re in the office or in the classroom, make sure you have your space organized, labeled, and clean. If you all follow me on my instastories, then you see my planner every week! Every Monday I fill out my week on things that need to get done, meetings, and due dates. This is important because I believe that by writing things done you are coding it in your brain that these things need to get done and you are able to visually see the amount of work and items that must get done. I usually like to write down my due dates in a different color so that it stands out in order for me to plan and prepare to meet those deadlines. The first thing I do each morning before getting started on tasks is read through my emails. If I’m being honest here I don’t read them over the weekend. As I am reading through my emails, I write down tasks and due dates on my calendar. After that I start responding to my emails right away. Since I receive lots of emails throughout the day, emails can easily get lost, so replying within the same day is a must for me or I will forget to respond. After that, now that I have written down my tasks that need to be completed, I prioritize them in to three sections. I actually got the idea from Stephen Covey Time Management Matrix and personalized it to my own. The three sections are divided by the priority needs and I usually have three post-it’s that are color coded (there is a computer app for this) on my computer home screen. The following sections are listed by A. Urgent, B. Important, and C. Important but not Urgent. This essentially has helped me in the long run when it comes to meeting deadlines and being productive with my time at work. Why re-invent the wheel? Collaborating or reaching out for help can essentially save you a whole lot of time. If I am struggling with something I usually reach out to someone who has answers. I know some people chose not to ask questions, because they feel like they will look uncreditable or lost, but that is not the case at all. It’s better to ask and know, instead of not to know and not ask. It is okay to ask and by asking means you get the work done the right way the first time around. I also enjoy any chance I have the opportunity to collaborate with my colleagues. I love sharing ideas, getting ideas and working together to accomplish the same goal. This week I encourage you to collaborate and ask away! If you use other methods for managing your time at work let me know below. What works for you, what doesn’t? 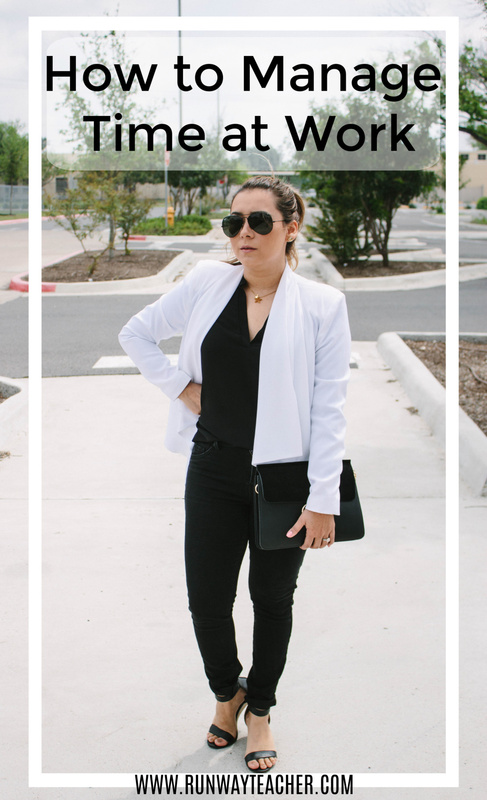 Shop similar white blazer outfit idea for work below. So important to stay organized so you can more easily keep up with things happening. I like the idea of having a planner and jotting down important goals. Good tips! I tend to check things off that I can get done quickly so I at least have some things done. Ha! 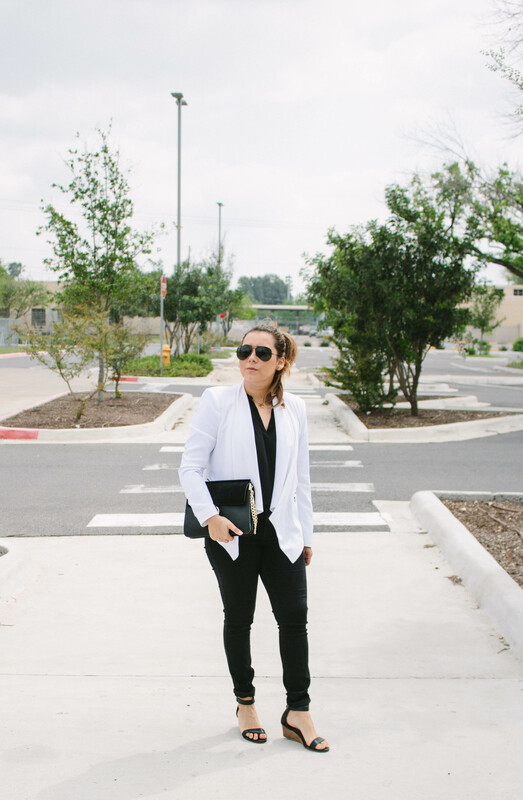 Time management is so important when you are balancing your blog with work, home, and life! These are great tips! 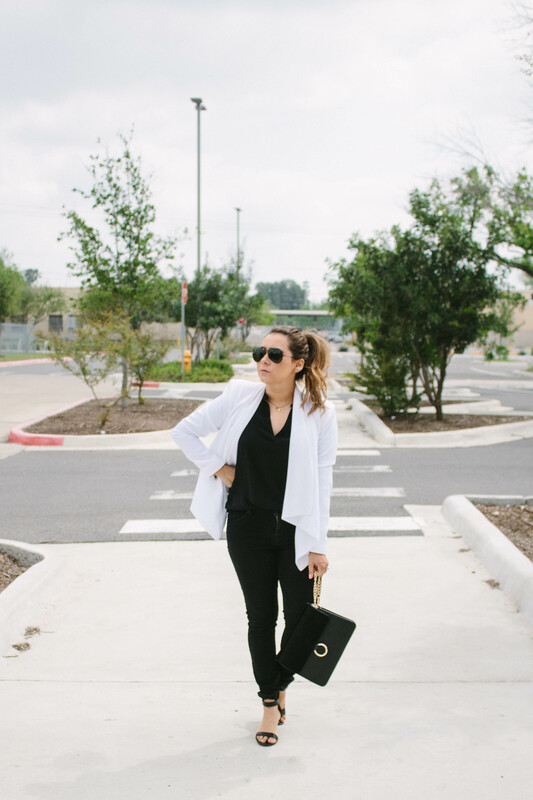 Love your classic black and white look! I always need to organize my space to organize my thoughts. Writing them down helps too!! Totally agree withyour tips! Great tips Robin. I work from home on this whole blog deal and can certainly use some time management skills. Your management trio is a great visual and one that I’ll be adapting. And your outfit is on point. Love it! Thanks for the tips and loving this ensemble hun. Great tips and love your style! such a chic look! looking awesome for spring! These are really great tips! I wouldn’t survive without my planner; and love the idea of prioritising by day, week and month! I’m definitely going to adopt this! Thanks Julia! I am such a planner person lol!